On September 1 Steve McCurry was awarded with the Leica Hall of Fame Award 2011. During this year’s Art Masters in Switzerland the Director of Leica Gallery Salzburg, Karin Rehn-Kaufmann, awarded Steve McCurry with a specially engraved Leica M9-P. We also had the chance to speak with Steve McCurry about his life and experience as one of the most renowned photographers. Q: What has served as inspiration for your work? A: We are all inspired by different things, but basically I think you have to follow your instincts. It is a fortune for me to work as a photographer and cover topics I am interested in. I want to see and experience the world we live in, to document different cultures, countries and people. It is a privilege for me to photograph all these extraordinary parts of our life. Every time I travel to different parts of this world I get my inspiration for my work. To experience all these differences is fascinating. Q: What drives you to get on a plane and document a certain event or topic? A: Once you’ve experienced the extremes of human behavior, you know that there are disparities or conflicts which should be seen. For several years, I have documented struggles, conflicts and the disparities between social classes. This can be the struggle between different religious groups, races or other ethnic groups. I have no explanation for the fact that this is all justified by many people, so I just try to document the facts as a photographer. Q: What are the experiences in your life as a photographer that stick in your mind and that always return? A: Many. Just take the case of the situation of people in India, the differences between those in low castes and high castes. I also do not forget the situations of civilians, who have involuntarily been caught in the middle of conflicts and end up getting hurt the most whether trough bombs, bullets or destruction of their homes. I have seen countless cases of civilians who happened to be living between the bombs. These are the people I do not forget. Q: How do you plan your trips? A: I try to spend a significant amount of the winter working in warmer climates. The reason for that is basically that in those regions, such as in Southern Asia, life takes place on the street and is vibrant and rich with activity. Q: You have traveled to many countries around the world. Which of your trips in what country will you never forget? A: I do not count the countries I have worked in, but there are certain places I return to often. For example, I’ve worked in Burma approximately 20 times just because the country and people living there are fascinating. But the country which I truly will never forget is India. In India I’ve experienced the incredible range of poverty and wealth, varied religions and languages. There are areas of high-tech communities and parts where people live in extremely rudimentary circumstances. I’ve never seen such vivid extremes in any other country. Q: Do you still remember what it was like when you started as a professional photographer? A: When you’re starting you are so eager and want to do anything just to get a foothold. Then as time goes on, you become more discerning and are no longer satisfied with what you’ve done. From my experience, many publications of my work were important to me at a first glance, but as time passed the coverage of assignments became smaller and smaller. Much of what I viewed as achievements early on has evolved and I’ve continued to push myself further. Q: Sure people forget some publications in magazines, but in your case the “Afghan Girl” image is unforgotten. What is it that makes a picture memorable? A: It is difficult to define those pictures. Some have become icons like the images by Dorothea Lange, Henri Cartier-Bresson and others because they speak to us in a very direct way. These iconic images can be described with certain concrete attitudes that go right to the heart. This is the reason why they hit us and we do not forget them. Those pictures are understood all around the world because they speak a universal language. 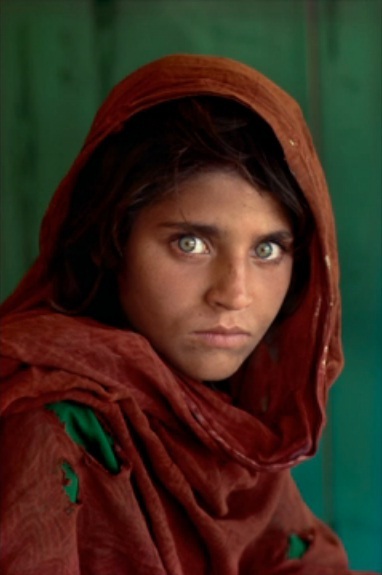 Q: When you first saw the “Afghan Girl” picture did you recognize that this will be a picture of that universality? A: I knew that she had extraordinary features, but this is not enough to make a powerful picture. The light and angle of an image is also very important. All those variables lined up well with that picture, but if you drop the ball on one of those variables you miss it. So I was just trying to manage everything at the same time. Sometimes even this is not possible, which I learned on 9/11. On that day, I had to rely on my reflexes because I even couldn’t think about any kind of variables of pictures. Q: In your career as photographer you have been honored with many awards; now you have received the Leica Hall of Fame Award 2011. What is your experience with Leica? A: Well, in all my years as a photographer I was fascinated by the mystique all Leica Cameras have. The photographers I admire the most all used Leicas. So to me Leica is producing legendary cameras and to receive an M9-P with my name on it was a great honor. Leica is a finely crafted tool which is simply the best. Many of those iconic pictures we spoke about were taken with a Leica. That’s impressive. You can view more of Steve McCurry’s work on his website: www.stevemccurry.com. There is currently a expo and prints for sale at Chris Beetles Fine Photographs in London of the works of Steve McCurry, also with an expo catalog (20 Pounds) available. so many images, so many stories. great body of work. … and yes, india truly IS “something else”, i am looking forward to my next trip there. thank you much for the quality of this posting!! Steve is a true inspiration to all who can see and feel the emotion and beauty in his work. We all thank you for your talent and eyes that see the fleeting moments so we may experience the people and cultures you share. Awesome work. Been a fan of his photography for a while. Anyone who is in Southern California can go visit his exhibit in Santa Monica. Its up there till Nov. 3rd. I’ve seen the Chris Beetles exhibition and my wife and I travelled up to Birmingham last year to see Steve’s exhibition at the Museum and Art Gallery. Having been an avid reader of Nat Geo since the 1970’s, I’ve followed Steve’s photos for as long as I can remember and it’s hard to think of many (if any) other photographers who have produced such exceptional, credible and visually stunning photographs over such a prolonged period. Congratulations indeed. Extremely well deserved.